So, Hillary's No Longer a Monster? From a story by the Associated Press's Matthew Lee about the forthcoming nomination of Hillary Clinton as SecState (here), I learned that Hillary is more magnanimous and tolerant toward former opponents than I would have expected. An adviser to Barack Obama's presidential campaign who was forced to resign earlier this year after calling Sen. Hillary Rodham Clinton a "monster" is now working on the transition team for the agency Clinton is expected to lead. I must say I'm surprised. I never figured Hillary for the kind to bury the hatchet. According to a story by Matthew Lee in the Associated Press (Agencies battle over security for Clinton) , there is a bureaucratic tug-of-war going on between the U.S. Secret Service and the Diplomatic Security Service over which agency gets the obligation to protect Hillary in the event she serves as Secretary of State. I've quoted the article below. Something missing from the story is any mention of money - budgets - the life's blood of bureaucracies. It costs horrendous amounts of money to protect the SecState during overseas trips. Whichever agency wins this tussle will have to spend megabucks on logistics (for example, air-transporting the necessary fleet of armored vehicles around the world). It's kind of the opposite of the situation in the old movie The Bodyguard: imagine that Kevin Costner had to pay to protect Whitney Houston, instead of getting paid. How eager would he have been to get that job? Despite all the talk of jealously guarded agency prerogatives, I'm not sure that either of these agencies really wants to win Hillary's hand unless she comes with a large dowry of supplemental appropriations. It may not be your typical Washington power struggle, but Sen. Hillary Rodham Clinton's expected nomination to be secretary of state has already locked two turf-conscious federal agencies in a delicate behind-the-scenes dance over how to protect her. Even before her appointment is announced, informal discussions have begun on resolving a conflict between the Secret Service and the State Department's Bureau of Diplomatic Security, both of which will be assigned to guard her if she becomes the nation's top diplomat. Officials familiar with the matter said the talks revolve around which agency will protect her at home and abroad and who will have the ultimate say in planning her security. As a former first lady, Mrs. Clinton is entitled to lifetime protection from the Secret Service. But as secretary of state that task normally would fall to the lesser-known Bureau of Diplomatic Security, the State Department's in-house law enforcement wing. Neither agency is eager to give up the high-profile job, which will be further complicated by the fact that Mrs. Clinton's spouse, former President Bill Clinton, who might accompany her on overseas missions and who is also protected by the Secret Service, the officials said. Clinton spokesman Philippe Reines declined to comment, saying the senator's office will not discuss speculation about her possible nomination or her security arrangements. ASSOCIATED PRESS Sen. Hillary Rodham Clinton is the last former first lady to be covered by lifetime protection from the Secret Service. If she becomes the nation's top diplomat, the State Department's Bureau of Diplomatic Security would have a stake in her protection. Spokesmen for the Secret Service and Diplomatic Security, who routinely refuse to discuss the details of their protective responsibilities, would not comment publicly on the matter. But other officials at the two agencies acknowledged that Mrs. Clinton's nomination would create an unprecedented logistical and jurisdictional hurdles that will require significant negotiation to resolve. The officials spoke on the condition of anonymity to discuss the internal deliberations. The officials said Diplomatic Security is concerned about losing its role as bodyguard to the secretary. The Secret Service, meanwhile, is loath to abandon Mrs. Clinton, who under legislation passed in 1997 will be the last former first lady to get lifetime protection, they said. It is not clear who will decide because such a situation has never arisen before. In the end, it may be up to Mrs. Clinton but the Homeland Security Department, of which the Secret Service is part, may play an advisory role, the officials said. Mrs. Clinton can renounce her Secret Service detail, and a compromise might involve a sharing of duty, with Diplomatic Security providing her with protection while she is at work in Washington or on the road but not while she is at home with her husband, the officials said. But such a solution would not address the possibility of Mr. Clinton traveling with his wife, especially if he doesn't give up his Secret Service protection. Diplomatic Security is far less well-known than its Secret Service cousin, even though it has been around since 1916 and, with agents in 157 countries, is the most widely represented U.S. security and law enforcement organization around the world. It jealously guards its role as security provider to the secretary of state and Cabinet-level foreign officials who visit the U.S. But it is the Secret Service, founded in 1865, that most people are more familiar with. It protects current and past presidents and their families, as well as visiting heads of foreign states or governments in the U.S. The FBI and Homeland Security have issued another of their vague terrorism warnings ("analytical notes") to local law enforcement agencies. See the Washington Post article Feds Warn About Possible Terrorist Plot Targeting NYC. As usual, they have no specific threat information and, consequently, no security countermeasures to recommend. They just want to drop their warning and let you make of it what you will. We have no specific details to confirm that this plot has developed beyond aspirational planning, but we are issuing this warning out of concern that such an attack could possibly be conducted during the forthcoming holiday season," states the warning, which is dated Tuesday. Knocke, the DHS spokesman, said the warning was issued "out of an abundance of caution going into this holiday season." No changes are being made to the nation's threat level, or for transit systems at this time. Here are news reports of two previous warnings, from November, 2007, and October, 2008. The warnings always follow the same script. Timing is critical, since you want the threat to sound like it is imminent, but under no circumstances do you want it to be specific or linked to a certain date, like, 'next Monday,' otherwise people will start keeping track of how often these warnings are duds. The latest warning covers "the forthcoming holiday season," which is a nicely broad time frame. By the time the holiday season is over, we'll have new things to worry about and will have forgotten that something or other was supposed to have happened in New York. I think of these FBI / DHS warnings as the Hallmark cards of the security industry, since they are sent out before all anniversaries and major occasions, religious holidays, national day celebrations, Presidential inaugurations, summit conferences, and so on. And that leads me to try my hand at some Hallmark-ish doggerel. here's a new analytical note for you. and against them there's no way to mitigate. al Qaeda will strike again one of these days. it will do you no good, but then, what the hell? So believe all our notes and our portents and signs! The Washington Times ran an editorial last week that excoriated the long over-due and fabulously over-budget Capitol Visitors Center, Washington DC's latest manifestation of the Edifice Complex. See: The Last GOP Boondoggle, most of which I've quoted below. It is a breathtaking vision of marble and glass, eye-catching exhibits, fountains, lanterns, seat-walls and woodwork. It fills 580,000 square feet and its price tag is astronomical - $621 million. [TSB note: that makes it only a little less expensive than the new U.S. Embassy Complex in Baghdad, or roughly the same cost as six new U.S. embassies of the normal type] Its original price tag was $265 million. All that money for what was supposed to be used as a holding zone for visitors waiting to tour the Capitol. Of course, upgrades were needed to modernize the aging visitors center, ensure handicap accessibility and accommodate an increase in visitors - tripling from 1 million in 1970 to nearly 3 million today. But are two, 450-seat theaters really necessary? Or a 500-seat eatery? The acting Architect of the Capitol, Stephen Ayers, defended the treasure, saying: "I don't think it's extravagant." Yet, the new structure is so over-the-top, NBC's Nightly News deemed it a "Fleecing of America" back in 2006 even before the final costs were tallied. Wisconsin Democratic Rep. David Obey said: "Pitiful oversight, exploding costs and embarrassing results." While it's still among the cheapest attractions in the nation's capital, being free, the improved Capitol Visitors Center is not the best use of taxpayer money. Actually, the Capitol Visitors Center is a handy symbol of why conservatives turned on the once Republican-led Congress - a pointless project on auto-pilot, hoovering up tax-dollars, without any protest from the solons who are supposed to be guarding the people's purse. Many public building projects end up exceeding their schedules and budgets, but the Capitol Visitors Center is in a class by itself. From its modest original concept as a visitor screening and holding area, the scope of work just kept metastasizing like an architectural form of Kudzu (the vine that ate the South) until the Center finally filled all the space available for it on Capitol Hill. There were no checks-and-balances at work here, unlike normal U.S. government construction projects, in which the Congress funds and the Executive implements. In this case, the U.S. Congress funded, implemented, and conducted oversight (or not) all by itself. The result was a monument to Congress, but not the kind they intended. Last February, a police officer in Fairfax County, Virginia, was convicted of improperly accessing official databases on behalf of a fellow Muslim who suspected he was under FBI surveillance (and he was). Now, a New York City police officer has been arrested for a similar offence - improperly accessing an FBI terrorist watch list as a favor to a fellow Muslim, one in Canada, who allegedly wanted the information in connection with a child-custody dispute. See: NYPD Sergeant Arrested on Federal Charges. Have there been many instances of this sort of thing, Muslims in U.S. local law enforcement placing loyalty to their coreligionists ahead of their official obligations to protect Federal investigative information? If so, it's a troubling trend. Does the U.S. Constitution (specifically, Article I, Section 6, clause 2) bar Hillary Clinton from being appointed Secretary of State? It just might. See yesterday's article in The New Republic, Hillary Clinton's Emoluments Problem. The SecState's salary was increased while Hillary was in the Senate, therefore it appears she is not eligible to serve as Secretary, at least not until after her Senate term expires. Now, there is a precedent for evading this clause; see the linked article for the "Saxby fix." And, of course, there is a chance that everyone will simply ignore the problem. Still, this will be interesting to watch during her confirmation hearing, assuming she is in fact appointed. I'm back from my temporary duty, which consisted of a brief visit to a volatile country and a drop-in at one of our most hazardous diplomatic posts. If you've been following the news, you can probably guess which diplomatic post that was from the following clues. All these incidents occurred there in the last week: a USAID contractor was ambushed and killed, an Iranian diplomat was abducted when departing his home for the office, two foreign journalists were shot, a suicide bomber blew himself up at the gates of a sports stadium, and, in a region outside the city, a missile strike of unattributed origin killed five al Qaeda figures, one of whom was reportedly a suspect in a 2006 plot to bomb ten airliners heading to the U.S. from Britain. In addition to all that, a few months ago the principal U.S. diplomat there was ambushed while en route to the office but escaped unharmed. A few weeks after that incident, the principal officer of another, non-U.S., diplomatic mission was successfully abducted in a similar attack. More to the point, why are any of my fellow citizens there? I was lucky enough to make a flying visit and be back outside the city limits before nightfall, but others are doing a full year's tour there. During that tour they are separated from their families, working in dilapidated and overcrowded offices, facing a substantial risk of attack every time they move between home to office, and are constantly surrounded by police and security escorts. I saw no striped pants, tuxedos, or dinner jackets on our diplomats there. The pants were either cargo-style or jeans. The women perhaps kept to a higher standard of casual dress than the men, but the diplomatic couture topped out around the L.L. Bean level. No one was passing out cookies on little china plates either, although the tiny on-site cafeteria where our diplomats eat lunch was selling fantastic banana bread made by one of the local employees who was originally a baker by trade. That statement by Senator Coburn's spokesman is a perfect example of the ridiculously out-dated, but generally held, public perception of fancy embassy life that, so far as I can tell, is derived mostly from movies. That misperception adds insult to the injury of the pay gap. In the public mind every embassy is London, Paris or Rome, whereas in reality there are 277 embassies and consulates, most of which are unimpressive, and they are often located in places far more dangerous and/or unhealthy than, say, Washington DC. The staff who serve in those places deserve their danger pay or hardship differentials, to say nothing of equity with other agencies in their basic pay. For the record, I say this as a non-Foreign Service employee who has no personal interest in the pay gap issue. He [the FSO quoted in the column] does quarrel, however, with Coburn's notion that foreign service officers are seeking huge raises on top of other big benefits. It's true that diplomats get a housing allowance and, in some cases, dangerous duty or hardship duty pay. But that doesn't negate the need to close the gap, especially for lower-level diplomats. That sort of rebuttal doesn't go far enough. Leaving aside the merits of correcting the pay gap, I'd like to see someone correct the American public's perception of embassy life. Some sort of Foreign Service Truth Squad that could fill in the picture of what life is like in all those places where our diplomats work out of ratty hovels rather than palatial surroundings. I saw that the FSO quoted in the WAPO column had previously served in the Central African Republic, which happens to be another diplomatic post that I have visited during my occasional forays outside the cubicle. That would be a good place to start correcting the image of embassy life, since no amount of pay or benefits could ever be enough to make diplomatic life in the Central African Republic desirable. I normally object to the term 'third world hell-hole,' but in the case of the CAR it applies, and then some. First of all, the place is isolated. Joseph Conrad wrote his great novel Heart of Darkness about a scary expedition up the Congo River to the uncharted center of the Dark Continent, but that Belgian trading post where his protagonist met Mr. Kurtz wasn't the true center. If you go up the Congo River to Conrad's metaphorical Heart of Darkness and then keep going, you will reach its tributary, the Oubangui River, and eventually arrive at the true center of Africa in Bangui, capital city of the CAR. Even by air, the CAR is isolated, with only a few weekly flights. On the day I was due to leave, I didn't bother going to the airport, since flight schedules meant less than nothing, but instead stayed at the embassy through the night and occasionally called the airport control tower to ask if they saw a plane on their radar yet. Secondly, the place is horribly impoverished. Our embassy there is located on a main street that I suppose was once paved but which long ago returned to a state of nature. Bangui seems to have reached its peak in the late 1970s, during the reign of Emperor Bokassa the First, and ever since then the city has been decaying to entropy. To relate a bit of local color, when I was there, the city had so few working fuel pumps that improvised gas stations were re-fueling cars from old wine bottles filled with diesel. The pervasive misery of the CAR isn't just my subjective impression. The CAR ranks #171 out of 177 countries measured on the UN Development Program's World Development Index, making it just about the sorriest place on earth. (FYI, Sierra Leone gets the honors of being #177.) In the CAR, life expectancy at birth is 43.7 years, the Gross Domestic Product per capita is $1,200, and only 25% of the people have access to an improved water source, i.e., plumbing. In a place like that, not even the foreign diplomats can escape the general privation. Having seen the U.S. embassy offices and houses in Bangui, and experienced the difficulties and uncertainties of simply getting there and back, I can assure my fellow Americans that Senator Coburn's lowliest intern wouldn't want to trade life styles with the most senior diplomat there, even with the housing allowance. Much less would he want to trade places with the diplomats in the hot-spot that I was happy to drive away from at high speed last week. Maybe there should be a Truth Squad counterpart to State Magazine's happy-talk Post of the Month feature? I'm packing my bag for another TDY, this time to a destination with low Internet availability, so I expect to be out of the net for the next week. The outbound portion of this trip will be reasonably comfortable, since I'll be in business class almost all the way, but the return trip will include a 15-hour economy class flight (ouch!). I'm just hoping United Airlines will - please, in the name of God and everything holy - let me trade frequent flyer miles for an upgrade on that flight. No, not Bill Ayers, it was this other university instructor in Canada. The French want to put him on trial for his participation in a 1980 attack on a Paris synagogue. 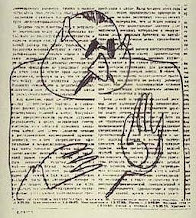 The academic life must hold great appeal for left-wing bomb tossers, since so many become professors in their old age. In addition to Ayers and his lovely wife Bernardine Dohrn, I can think of: Mark Rudd (another Weather Underground colleague of Ayers who now teaches at a junior college in New Mexico), Susan Rosenberg (convicted for possession of more than 700 pounds of explosives and a stockpile of illicit weapons, pardoned by President Clinton, hired by New York's Hamilton College), Sami al-Arian (who pled guilty to conspiracy to assist the Palestinian Islamic Jihad Movement while a professor at the University of South Florida) and, over in Greece, Alexandros Giotopoulos (the economics professor who headed the Marxist terrorist group 17 November). What wonderful memories they must have. I'd love to be in the faculty room sometime when they reminisce about the good old days. The best I've seen in months, actually. It's the new Navy slogan: "Life, Liberty, and the Pursuit of All Who Threaten It." On this Veterans Day morning I attended a brief ceremony in the cemetery of my local church in Annandale, Virgina. American Legion Post 1776 of Annandale placed American flags on the grave sites of the twenty-five veterans who are buried in the church yard. Afterwards, I read the headstones on those graves and noted that most of the men had served in the Second World War, a few in the Great War or the Spanish-American War, and three in the Civil War. Among the Civil War veterans was one Elhanah W. Wakefield, a First Sergent in the 2nd Massachusetts from 1863 to 1865, who has a special connection to that Annandale church. In 1864, when Union troops around Alexandria, Virginia, were being raided and harassed by Confederate partisans under John Singleton Mosby ("the Grey Ghost"), First Sergent Wakefield was ordered to burn down the Annandale Chapel, and he did so. The reason for the order is no longer known, but possibly it was in reprisal for assistance given to Mosby's men by local residents. One year later the war was over, and Wakefield choose to be mustered out of the Army in Alexandria, where he married a local woman. He then helped to re-build the Annandale Chapel, and later became its Sunday School superintendent. He eventually became an ordained minister and started another chapel nearby (today known as the Wakefield Chapel, and a Fairfax County historic site). When Wakefield died in 1920, he was buried a few feet from the Annandale Chapel he had restored, which still stands and is in use on Colombia Pike. A fuller account of Wakefield's story can be found here, based on contemporary sources from around the time of his death. J.S. Mosby also had a sort of reconciliation with his old enemies, but not until one hundred and ten years after the war. When the U.S. Army built a training center for reservists at Fort Belvoir in Mosby's old stomping grounds of northern Virginia, it was dedicated as the John Singleton Mosby United States Army Reserve Center. When I was in a Reserve unit and attended drills there, it always tickled me that the place was named in honor of a man the U.S. Army would once have hanged if only it had been able to catch him. Was this the lamest special effect ever? 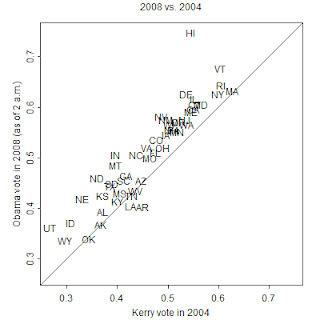 These state-by-state scatterplots show the regional distribution of the Obama vote in 2008 versus the Kerry vote in 2004, and the Kerry vote versus the Gore vote in 2000. 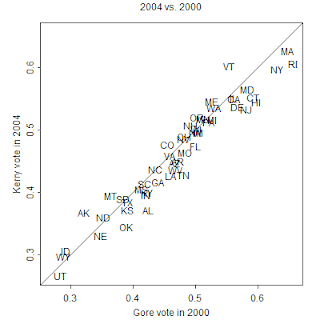 The states above (left of) the 45-degree diagonal line are those that went Democratic. The plots look pretty similar, huh? To be precise, the standard deviation between 2008-2004 was 3%, and the 2004-2000 SD was only 2.4%, so the electoral map has not changed much since 2000 apart from the obvious outlier of Hawaii (favorite son effect). The plots come from a blog called Red State, Blue State, Rich State, Poor State, which is written by a group of professors in political science and statistics departments. They have highly satisfying stuff if you like your election analysis quantified and on the dry side. A private newsletter for Federal employees (Fedsmith.com) polled its readers on the eve of the election and found they favor McCain over Obama, 51% to 46%. Here's the story: Is The Presidential Election Close? Very Close According to Latest (and Last) Survey Before the Election .